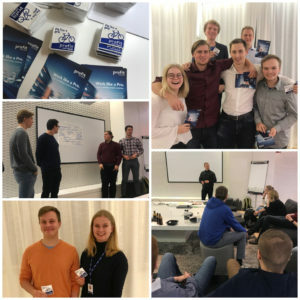 Smiles, cheerful chatter and compelling conversation filled the atmosphere of Profit Software’s Espoo Office some weeks ago, when an excursion was organized for the students of Aalto University’s Electrical Engineer Guild, SIK. Last summer Profit Software brought together a team of students from different countries and backgrounds to implement a project, designed to suite the crew of the summer trainee team. Apart from the topic, everything concerning the project, was given into the hands of the bunch. The results, of the work this project led to, were gratifying and all contributors were left passionate for more of such energy. Thus, a team was set up on Profit Software’s end to plan more similar projects for the summers to come. The first step towards the goal was taken, when a student excursion was planned and performed in November. A group of over 20 future experts of technology arrived to Profit Software’s office on a Tuesday afternoon, equipped with an open mind. What was awaiting them, was a project, or a couple, a welcoming Profit-team of almost 10 people, who work on different fields in the same company and of course food and beverages. The evening started off with an insight into the work of the previous summer trainee team, presented by a couple of team members. Conversation between the presenters and the audience was sparked instantly and from there on, the evening was not filled by one-way-presentations, but by agile and constructive conversations. After brief discussions on the summer, some of our experts gave the students a few project topics, that participants were to work on. Project titles included concept modeling of Peer-to-Peer Lending and Microinsurance services. With the guidance of our staff, in teams, the students came up with posters and other means of presentation, to pose their solutions to the given tasks. Both the production and the presentation of the activity seemed to be inspiring and entertaining for all. Work on the presentations, not only gave the students the chance to learn something new, but it also led to us organizers learning plenty. In gratitude, the best posters were rewarded and the students were presented with a demonstration on how to use a dataset tool, they could use in their studies or future work. After several guests wishing for present employees to go more into detail about what they do at Profit Software, a final round of in depth introductions of the staff was delivered. It was motivating to see how many participants were intrigued by what we do here at Profit Software. As we have come to see, students truly give us great insight into new perspectives in our business. We hope, that the experience was as inspiring to the participants, as it was for us. We look forward to more collaborations of this sort and cannot wait to introduce our business to more students every year. 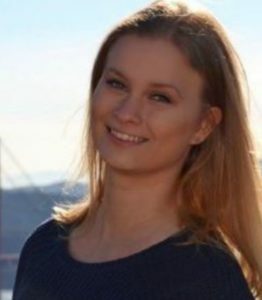 Emmaleena began her studies at the School of Electrical Engineering in Aalto University, fall of 2017. The first year flew past with studies and plenty of extracurricular activities. Last summer, Emmaleena started working for Profit Software as a part of Profit Software’s Summer Trainee Team. The team organized and implemented projects, learned a lot together and enjoyed the summer. After a summer well spent, Emmaleena has kept up her studies and in addition is now working for Profit Software part-time. Today, she is furthermore enjoying her work and learning more every day. Interested about working for Profit Software? Read more on our Careers page!